Editorial Note: As some one who sat on the Cairngorm Partnerships (fore-runner to CNPA) Recreation Forum and, along with NEMT, studiously responded to consultation documents prier to the release of the first Cairngorm National Park Plan, our lead article by Drennan Watson rings alarm bells. If CNPA gives this new town the go-ahead, then the consultation game really is a bogie... We know Christmas is coming, but help is needed, please send in a donation. Every little helps... as they say. SOMETHING MAJOR HAS TO BE SERIOUSLY AMISS! Taking a government authority to court is an expensive and arduous business, yet a group of voluntary bodies is taking the Cairngorms National Park Authority (CNPA) to the Court of Session in Edinburgh regarding the Cairngorms National Park Local Development Plan. Voluntary organisations like the Cairngorms Campaign, the Scottish Council for National Parks and Badenoch and Strathspey Conservation Group, have to feel driven to do it. The appeal focuses on proposals in the Cairngorms Local Development Plan to build hundreds of houses in Carrbridge, Nethybridge, Kingussie and, above all, An Camas Mor far in excess of local social need. An Camas Mor is a proposal to build an entire new town of initially 1,500 houses in a National Park in an already highly sensitive area of the Cairngorms directly across the river from Aviemore which is already planned to be doubled in size. These developments would directly damage a range of protected and threatened species like capercailie and red squirrel and habitats like semi-ancient woodland and species rich grassland, which are concentrated in the low ground of the straths and that alone would justify strong opposition. However it is not just the direct impact of these developments on protected species and habitats on and around these sites but also the basic principles that have been set aside in reaching these decisions which is alarming, as explained below. The court submission lists priority species meant to be protected by the Cairngorms Biodiversity Action Plan and the Scottish Biodiversity Action List and UK Priority Red Data Books, and asserts breaches of the European Union Habitats Directive and / or the Wildlife and Countryside Act (1981). More fundamentally, it asserts CNPA failed to give adequate attention to the first aim of the Park, To conserve and enhance the natural and cultural heritage of the area. Scotlands National Parks are uncertain. The Local Development Plan for the Park is a key document guiding sustainable development and important for the future of mountains rivers and straths and hence the future of the Park. The four basic aims of these national parks, are laudable, but nothing specifically to do with management of protected areas or vulnerable mountain areas. These are simply rules of good governance applicable anywhere in an integrated way. GIVEN TO THIS AIM AGAINST THAT OF DEVELOPMENT. This is a rather frail but key condition for the successful operation of national parks in Scotland and, if it can be ignored in a wholesale way as it has been done in the cases cited in the court case, then what is the future for the Cairngorms overall under such a regime? Further, the whole housing policy is an unsustainable approach to tourism development as it simply leads to the building of large numbers of holiday homes. All research on tourism development in areas like the Alps shows this causes greatly increased environmental impacts from development, social damage to communities and poorer economic return to them from tourism. THE WELL FOUNDED OBJECTIONS OF THESE VOLUNTARY BODIES WERE SET ASIDE. Lastly, it is an unsustainable approach to development in protected mountain areas. Successful protection of vulnerable core mountain areas like the Cairngorms in the face of intensive tourism development depends on the protective function of surrounding foothills as a buffer zone. 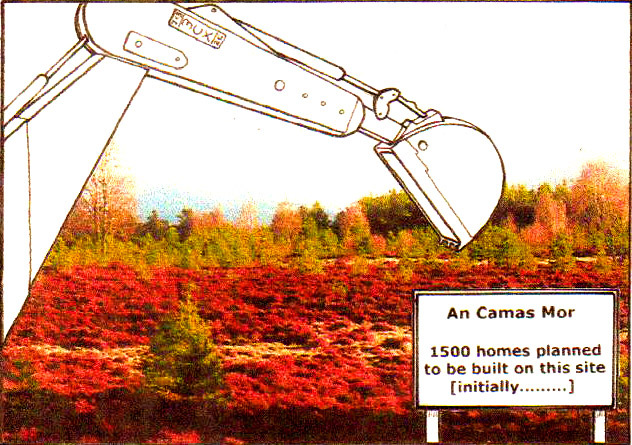 Apart from the fact that the concept of founding a new town in a National Park seems, to say the least, doubtful, An Camas Mor, would be sited at Glenmore, exactly where no protective foothills exist and close onto the chief area of recognised conflict and tension in the Cairngorms and where the CNPA itself identifies as a place of intense visitor pressure. It is important that all that has been learned from experience of the management of national parks and similar protected mountain areas elsewhere in the world  now a considerable body of knowledge  is applied but this just does not seem to be happening. FOR £50,000 TO COVER LEGAL AND OTHER EXPENSES. IF YOU WOULD LIKE TO DONATE, PLEASE DO SO ONLINE @ JUST GIVING AND TYPE CAIRNGORMS CAMPAIGN IN THE DONATE TO CHARITY SEARCH BOX. OR SEND A CHEQUE, OR CAF, PAYABLE TO THE CAIRNGORMS CAMPAIGN, TO TIM AMBROSE, TREASURER, CAIRNGORMS CAMPAIGN, GOWAN COURT, LITTLE BRECHIN, BRECHIN, ANGUS. DD9 7QY. PLEASE ENCLOSE A NOTE SAYING IT IS A CONTRIBUTION TO THE FUND. BY STATING THAT THE CONTRIBUTION SHOULD BE TREATED AS A GIFT AID DONATION. Editorial Note: NEMT is making a donation and writing to each of our Club Representatives encouraging them to do so also. Editorial Note: We hope you like our front cover (reproduced on this Page) depiction of the foregoing a collage using a photograph from the Badenoch and Strathspey Conservation Group and the artistic and design skills of lain Macdonald.